Our flights in the world-famous national park, the Lake District, take in stunning views of Morecambe Bay before continuing towards the magnificent Lake Windermere. Departing from the picturesque surroundings of Greenlands Farm Village in Carnforth, you will also be treated to views of Bowness, as well as Belle Isle – the largest of Lake Windermere’s 18 islands, and the only one to have been inhabited. As the aircraft turns back to your departure location, now is a last chance to take plenty of photos in order to relive the unforgettable views of some of the UK’s most incredible scenery with your family and friends back on the ground. All flights come in the form of a gift voucher, valid for 12 months, and can be booked in on the selected dates listed below. Flights purchased through the website will come with an open-ended date and time, allowing the recipient to book themselves in after they have received their voucher. If you prefer to specify a date upon purchase please call the office on 01664 823 846 to place your order. The Central Helicopters’ Lake Windermere Tour takes you over the breathtaking Lake District and one of the UK’s most recognisable lakes. 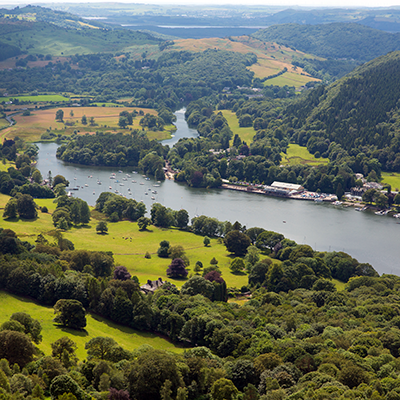 From our departure site, set in acres of rolling countryside this tour of approximately 30 minutes heads west towards Newby Bridge at the base of Lake Windermere, viewing the remarkable landscape that unfolds beneath you is one of the most amazing flying experiences. You will turn north towards the historic Belle Isle, past Storrs Hall and the Marina up to the town of Bowness situated on the banks of the lake. As you continue northwards, you will take in spectacular panoramic views of the Furness Fells to the west before reaching Ambleside at the far north of Windermere. This truly is a breathtaking helicopter trip. Whichever way you look, you will be amazed at the incredible scenery. A must for young and old alike; for walkers, photographers and anyone with a quest for adventure! If you would like to enhance your flight experience and make it extra special why not book the Co-Pilot seat. As this additional option is extremely popular and availability is limited, early booking is essential to avoid disappointment.